Unfortunately, I don’t know who to attribute this quote to, as my research provided inconsistent results, so I’ll leave it as “author unknown”. The quote resonated with me—particularly today. I didn’t eat right yesterday (translation: I ate sugar, gluten, AND dairy) and my body is not thrilled with me. I need to make amends. That thought about making amends made me think about my perception that my body is comprised of a lot of different personalities. No. This is not a psychological matter, but rather an understanding of all of my body parts that make me who I am. This includes all of my organs, miles of vessels, channels of lymph, etc. If I listen to the organ at that point, I may not even be aware that there was an issue. My subconscious might take over and send the message to drink a lot of water to flush out whatever isn’t working quite right, and that action may address the issue. However, if I am not paying attention, or I choose to ignore the first message my organ sends to the brain, then the organ might get a little more insistent. Some of my organs are like grown-ups. They have a long attention span and they will continue to send me messages, with increasing urgency, and increasing frequency until I listen, over a long duration. Some of my organs have the personality of a toddler. This isn’t a value judgment. I love all my organs, but some of them are a lot needier and a lot more temperamental than the rest of them. The organs that have the temperament of a teething baby may not even bother sending the initial twinge. They might go full-on DEFCON 1 with their first notification to the brain that they are unhappy with their current circumstances. I used to believe in the mantra, “Better living through pharmaceuticals.” Now, I will try just about any “alternative” approach to fixing the twinges in my body before turning to pharmaceuticals. 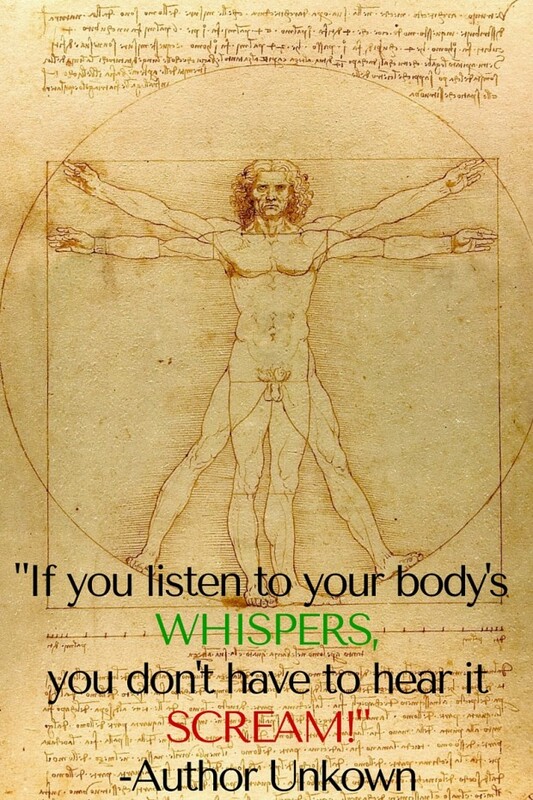 Interestingly, the more I listen to my body, the more sensitive she becomes. I seem to be allergic or sensitive to a long list of foods. In the past, the resultant symptoms would take some time to present in my body. Now, sometimes I can sense an issue as my hand is bringing the food to my lips. In the past, I think I had more of an attitude that the brain was in charge and all my body parts better get on board and do what was expected. I had more of an authoritarian approach to “governing” the organism that is my body. Now, I feel like the brain is more like a good leader who cares about all of the individual pieces that comprise the body. The leader still expects every organ to do its part, but is also compassionate when an organ is in need of some healing. I still have some disconnects between the food pleasure center and the nutrition that is required by my organs, but I am getting better at acknowledging dis-ease early as well as making better food choices to support the organs. It’s a work in process. The moral of this story is that if you listen to your body, you will learn a lot and if you take appropriate action, your body will reward you by doing its best to work at optimal levels.